The Yom Kippur fast begins on Friday evening. After a long fast without food or liquids, it’s important to ease yourself back into eating. I know most of us are tempted to “dig in” and stuff ourselves silly, but eating too much too quickly can really upset your tummy. Your digestive system cleanses itself during the fast, so you don’t want to immediately fill yourself with lots of heavy foods. It’s best to slowly “wake up” your digestion with natural and healthy whole foods, like fruits. No strong flavors or spices; mild and gentle is key. This smoothie is a natural way to re-hydrate and re-energize after the fast. It is made with a base of coconut water, a natural source of electrolytes. Bananas are easy on the stomach and nourishing; they also contain potassium, a natural electrolyte, and pectin, which helps restore normal digestive function. Coconut milk is also a rich source of manganese, which helps to level blood sugar. Strawberries also contain manganese, as well as Vitamin C to help boost immunity. This smoothie is dairy free, but it tastes rich and creamy thanks to the addition of coconut milk. Roland Coconut Milk is kosher certified and available at most kosher markets. So Delicious Organic Coconut Milk Creamer has less calories than traditional coconut milk, and it will add a nice creaminess, too—but it does have some sugar. It’s also kosher certified. Coconut water can be found at most grocery stores; Vita Coco brand is kosher certified. There may be others, too. If you don’t like strawberries, feel free to substitute blueberries or a berry mixture. Mangoes would also work well. This smoothie is vegan, gluten free, and pareve. G’mar Chatima Tova! This creamy coconut water smoothie will rejuvenate and rehydrate after the fast. Strawberries, bananas, coconut milk. Dairy free, gluten free. If using fresh strawberries, stem them and rinse them clean. 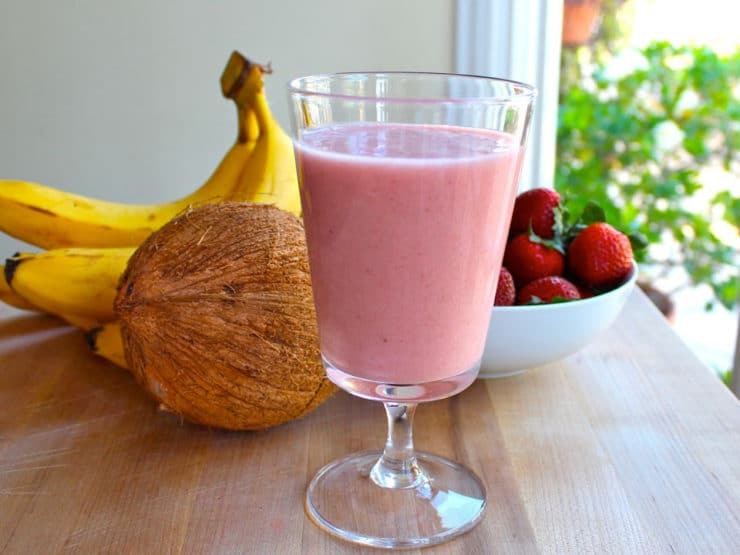 Combine strawberries, bananas, coconut water and coconut milk in a blender. For a colder smoothie, you can freeze fresh strawberries prior to blending, or add a few ice cubes to the blender. Pulse, then blend until smooth. Taste. Add sweetener to taste, if desired. Blend again. Serve. Yum! Thank you for this! I bought coconut water & coconut milk when they were on sale & have been trying to find a delicious smoothie recipe to make. I didn’t have enough strawberries & one less banana but it still tasted great. Also, enough sweetness so I didn’t have to add any extra. I love to drink coconut water.It is very delicious and tasty.It is under nature.When we drink coconut milk it looses fat content. Thanks for giving such informative information…. This does sound great and very tasty. I would make one change only because of my own preferences and lose the coconut milk due to the high fat content. Not sure what I’d substitute, though, that is non-dairy. A blob of sweetened yogurt would do when dairy doesn’t matter! Coconut water is great stuff! you’ve just inspired me on how to use coconut water aside from drinking it straight from the fruit. thanks a lot..keep blogging! I love coconut water! What a perfect way to break the fast! I am going to make this with So Delicious Sugar-free Vanilla coconut milk! It is really creamy, and well, so delicious! This smoothie looks fantastic! I’ve never tried coconut water, but I do love coconut milk and I bet it gives this smoothie a great flavor! How long is this Fast? 25 long hours… but got through it just fine! Felt amazing the next day. What a great way to break the fast. Wishing you well on this most important of holidays!